Russian President Dmitry Medvedev has recently gone on a tour of Silicon Valley in California in an effort to create a similar tech central in Moscow, Russia. Medvedev went to Twitter HQ where he met co-founders Ev Williams and Biz Stone and even created a Twitter account and sent out his first tweets – learning from the masters themselves. President Dmitry Medvedev also visted Cisco where they approved a $1 Billion technology investment into the Russian IT industry. 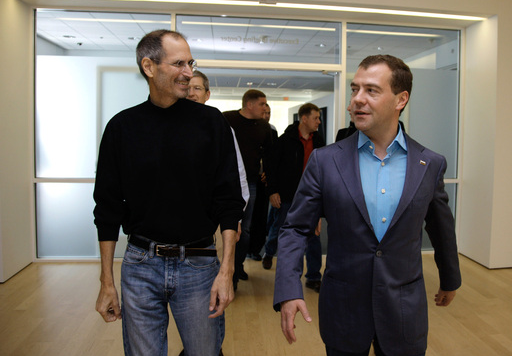 Medvedev also visited Steve Jobs and team at Apple HQ. Seems like a fun day out for Mr Medvedev – very lucky! Medvedev also met with Russian business people in Silicon Valley, telling them to share their technological learning with a new high-tech technology hub being built in a Moscow.